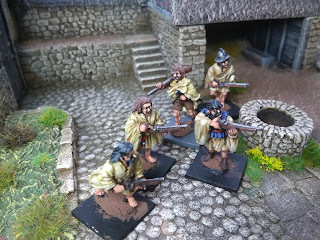 New post on the blog wth Pictures and write up for the Irish Shotte and some of the minor conversions. nice. I'm doing the not as pretty later period. Re: wicker shielded Irish – perhaps use for Ulster Kern. One source mentions wicker shields. Yeah I have seen that and if I had a bunch of them with wicker sheilds that is the way I would go, but just the two, I will put them to one side and come back to them later I think. The later period is still pretty but has a definately different character.